Dharma Practice Dates on FPMT.org is a collaborative project between FPMT International Office and Liberation Prison Project, an FPMT service offering Dharma support to interested prisoners around the world. If you’ve benefited from Dharma Practice Dates, please considering buying a print calendar through the Foundation Store, which supports both organizations and allows Dharma Practice Dates to continue. Prepared by Nawang Thartho, based on Tibetan Medical and Astrological Institute’s calendar. Additional advice from Lama Zopa Rinpoche, Spiritual Director of FPMT, and Geshe Nawang Dakpa. We have marked days* that are auspicious and inauspicious for various activities, and days that are favorable and unfavorable according to the combination of elements: earth, air, fire and water. These combinations impact on the effectiveness of one’s activities as well as one’s health. *Date based on India Standard Time*According to Ven. 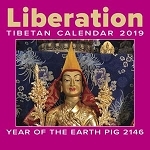 Choden Rinpoche, one of Lama Zopa Rinpoche's teachers, observation of auspicious days should be according to the date in India, not the date in one's home country. Therefore, when Lama Zopa Rinpoche is not in India, Rinpoche celebrates Buddha Days and other auspicious dates according to the time in India.